Sen. Cathy Manchester, R-Gray, smiles after taking her disputed seat in Augusta on Wednesday. 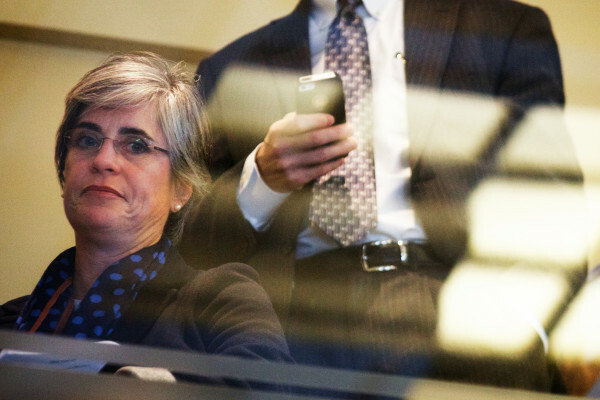 Democrat Cathy Breen watches from the Senate gallery in Augusta on Wednesday as her Republican rival for District 25, Cathy Manchester, takes her seat. AUGUSTA, Maine — Despite an ongoing debate about the results of the election in Maine Senate District 25, majority Republicans in the Senate overwhelmed Democratic opposition to provisionally seat GOP candidate Cathy Manchester on Wednesday morning. The Senate is the final arbiter in deciding who will be seated in a race that is still contested after a recount. In a brief interview, Manchester said she expects to be seated permanently after a special Senate committee conducts an investigation into the contested election and makes a recommendation about who to seat. Manchester’s opponent, Democrat Cathy Breen, was declared the victor by a 32-vote margin in an initial tally of votes after Election Day, prompting Manchester to request a recount. After the recount was conducted on Nov. 18, the result flipped, with GOP candidate appearing to have won by 11 votes. But questions have been raised by Democrats, including Secretary of State Matthew Dunlap, about so-called “phantom ballots” from the District 25 town of Long Island. On the evening of the recount, 21 new Long Island ballots were discovered, all of which contained votes for Manchester. None of those ballots were accounted for on Election Night voter lists from the town, nor could they be traced to any actual voter. Republicans have dismissed the irregularity as a normal part of ballot recounts, but Democrats still contest the result and have raised the specter of voter fraud, and called for a thorough investigation. Breen issued a letter to the Senate, calling for neither candidate to be seated until the special committee’s investigation was complete. She said she was disappointed by the GOP’s move to seat Manchester. Dunlap had recommended that Breen be provisionally seated, citing precedent that has seen Election Day winners of contested races take temporary office until the matter is resolved. The Senate voted Wednesday on party lines, 20-14, to seat Manchester, who temporarily gives the GOP a seven-seat majority. She will hold the seat until the Senate makes a final decision on the contested race. The special election committee of four Republicans and three Democrats was also created Wednesday. The group, chaired by GOP Sen. Roger Katz of Augusta and the assistant Democratic leader, Sen. 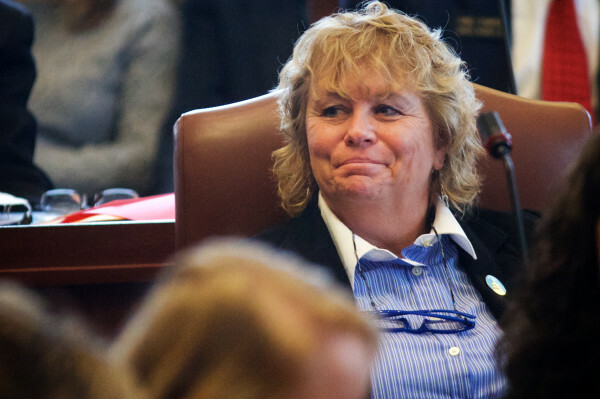 Dawn Hill of Cape Neddick, held its first meeting after the Senate recessed. While the tenor of talks between Democrats and Republicans on the committee remained cordial, rifts appeared quickly as Katz and his GOP colleagues made clear their expectation that the special committee would finish its work quickly. The group will reconvene on Dec. 9, and expects to interview the Long Island municipal clerk and election official Brenda Singo, as well as the two candidates or their representatives, and anyone involved in the initial ballot count or recount. “It’s my hope that we can complete this process in one day,” Katz said. Democrats, however, want to leave the process open if necessary. “In my mind, there are no restrictions on time,” committee member Sen. Bill Diamond, D-Windham, said. Democrats also want nine disputed ballots from the Senate District 25 towns of Gray and Westbrook to factor into the committee’s deliberation, while Katz said he feels only Long Island’s 21 unattributed ballots should.